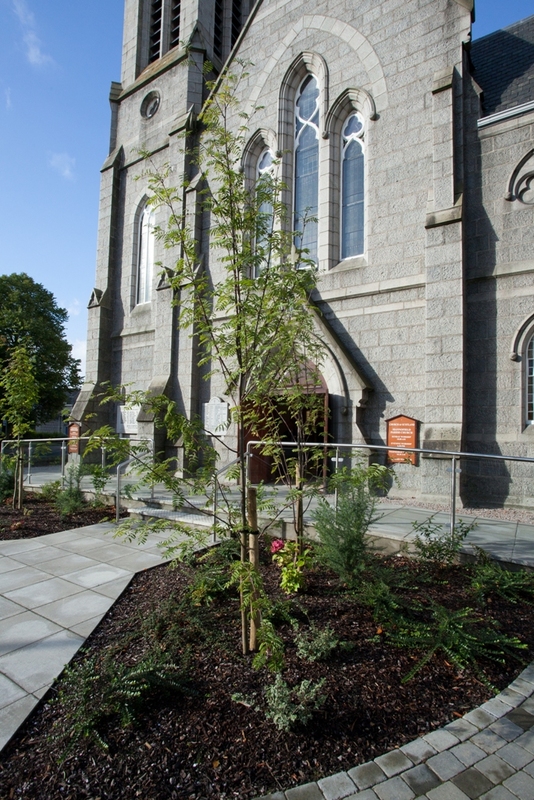 In 1880, the first approach was made to Aberdeen Presbytery for permission to set up a new congregation at Mannofield. 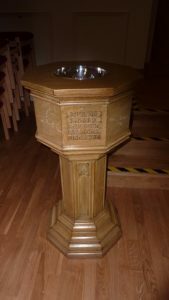 Plans quickly followed for the site of the new church to be situated at Countesswells Road and then, as now, there was much hard work and fund raising, donations and grants and in particular the vision, determination and generosity of Mr. William Gordon. Rev CC. McDonald conducted the first service on 27th February 1881 in a temporary wooden building. The Rev William Forbes was inducted on 10th March. 1881 and work on the new church buildings was started with a seating capacity of 700 (now 635). The Rev. Dr. H. Story who later became Principal of Glasgow University, opened the building familiar to us today on 30th July 1882. The desired status as a parish church was granted to Mannofield in March 1882. The original Church was situated directly in front of the present building. It was a wooden structure known as a Chapel of Ease. 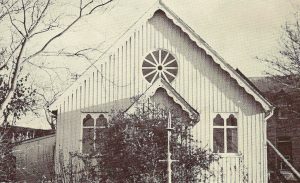 The building had been brought from nearby Craigiebuckler to act as temporary church accommodation, and following the erection of the present stone building it went on to serve as a temporary place of worship in nearby Kenfield, and then Bieldside, before finally being demolished in 1969. The first service took place here on 27th February 1881 conducted by Rev. C. C. MacDonald. The west window of the church was donated by William Gordon in 1892 in memory of his sister who died that year. Gordon was instrumental in the founding of Mannofield Church, was an elder here and held the position of Session Clerk for 9 years of the Church’s history. This vibrant stained glass window depicts the family of Bethany showing Martha in a position of servitude, Jesus teaching, Mary in devotion and Lazarus. The four other figures are Moses with the tablets of law, David as psalmist, St. Peter as the keeper of the keys of heaven, and St. Paul as the leader with a pastoral staff. The inscription reads: ‘In thy presence is fulness of Joy’. Messrs Clayton and Bell produced the window. The stained glass window in the south transept is an allegorical interpretation of the verse from Psalm 126 “They that sow in tears shall reap in joy”. The Rev John Anderson chose the text. 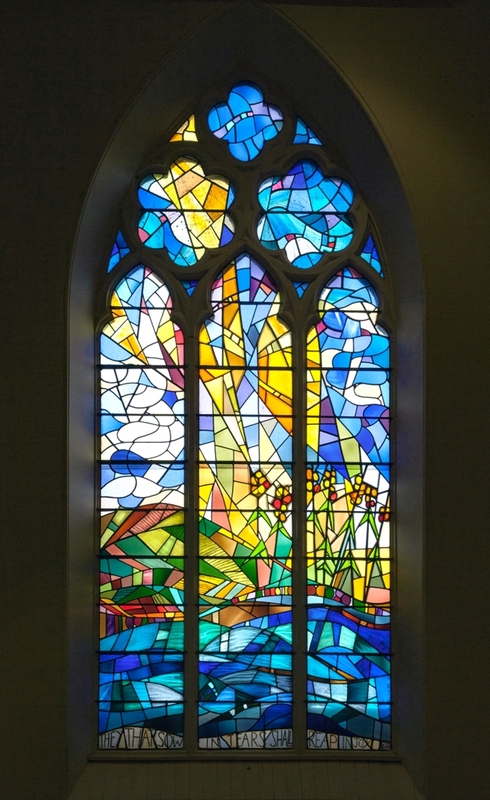 The window was designed in 1989 by John Patience RIBA an architect then based in Riverside Drive Aberdeen with an interest in stained glass design. Prior to designing the Mannofield Church window Mr Patience spent time with American artist, Harvey Salvin in his studios near Boat of Garten and Edinburgh when he created the windows for the Aberdeen Crematorium. The window was made by Martin N Farrelly in his Crathes Studio and installed in 1989. 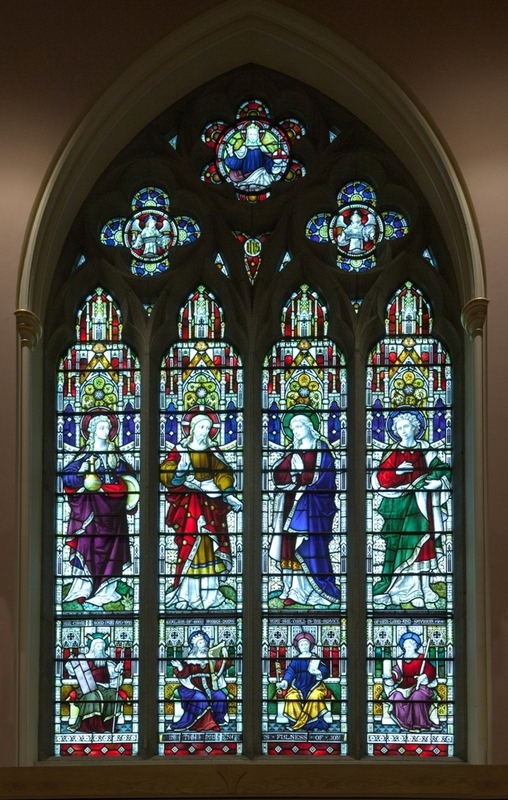 The window in the north transept was designed and installed by Shona McInnes and dedicated in May 1999. The theme of this window is “The calming of the storm” and the inscription is “Will your anchor hold in the storms of life”. 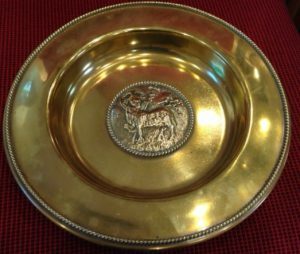 This was provided by a legacy left to the church by the late Isobel Calder. 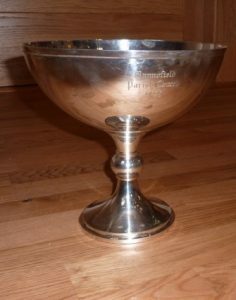 The bowl in the Font is dated 1888 and is thought to have been the former Common Communion Cup. 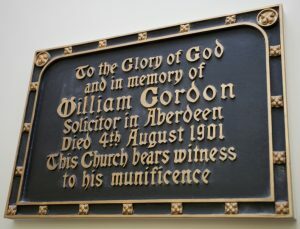 The wall mounted tablet in the vestibule bears witness to the benevolence of Mr. William Gordon. 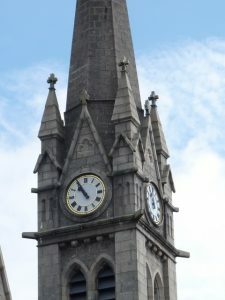 In 1885 a large clock with four faces was installed in the church tower in response to a growing public need for timekeeping. At one time a clock- maker would regularly visit public clocks in the area to ensure they kept correct time. The clock is now maintained by Aberdeen City Council. A granite war memorial was installed in 1921 recording the names and military units of the fallen. Later a second memorial to the fallen of World War II was also installed. 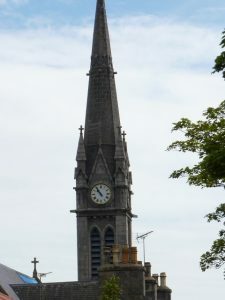 A replica of the ‘Mither Kirk’ and the second tallest church spire in Aberdeen. 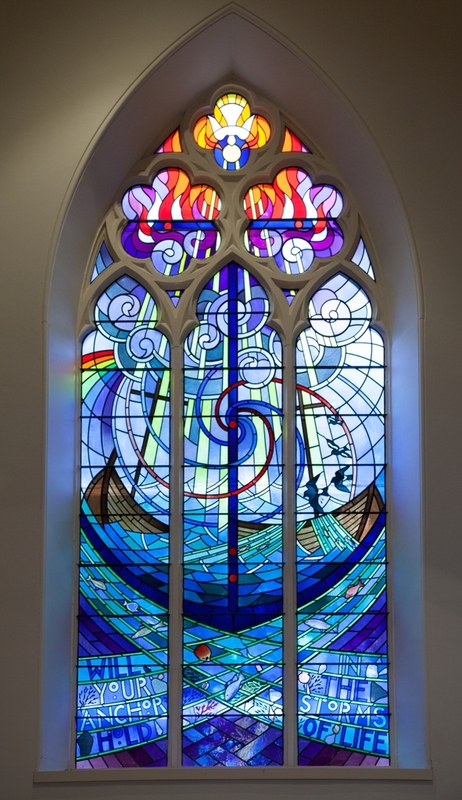 The design intends to echo the themes of the existing stained glass windows within the transepts of the chancel, a reminder of mans’ place on earth, our local heritage and traditions of seafaring and farming around Aberdeen. The heavens, sun and moon indicate the rhythm of our daily lives. The apple tree echoes the Garden of Eden, Adam’s early account in the Old Testament and the life sustaining bounties and the Grace, which God continues to bestow upon us. Horse chestnut trees, familiar to us, living sentinels around the Church building, endorse a sense of place and our responsibility of stewardship within the Parish. The ‘birds of the air’ suggest family life, a couple sharing, and echoes the story of the Ark with animals entering two by two. Continuing the Flood theme, storm clouds and lightning flashes over the sea allude to ‘the storms of life’ as well as the dangers within our local fishing, shipping and oil industries. The rainbow, a glowing symbol of hope, reminds us of God’s promise to us and His unconditional constancy. The original simple Church building of Mannofield (Chapel of Ease) set alongside the existing structure, presented in current digital form, records our history and aim: to be the ‘Heart of the Community’. The salmon harvest repeats the fishing theme both at sea and in the local rivers of the Dee and Don, reminding us of Jesus’ aims and practice as a ‘fisher of men’. The cereal harvest echoes our prayer: ‘Give us each day our daily bread’ whilst the five loaves and two fishes remind us of the feeding of the five thousand and the many other miracles Jesus performed in His short three-year ministry. The turbulent waters and jagged shapes of the right hand panel create a sense of frenetic unease. Whereas the peaceful serenity of the left hand panel highlights the delicate balance that underlies our environment and earthly existence. 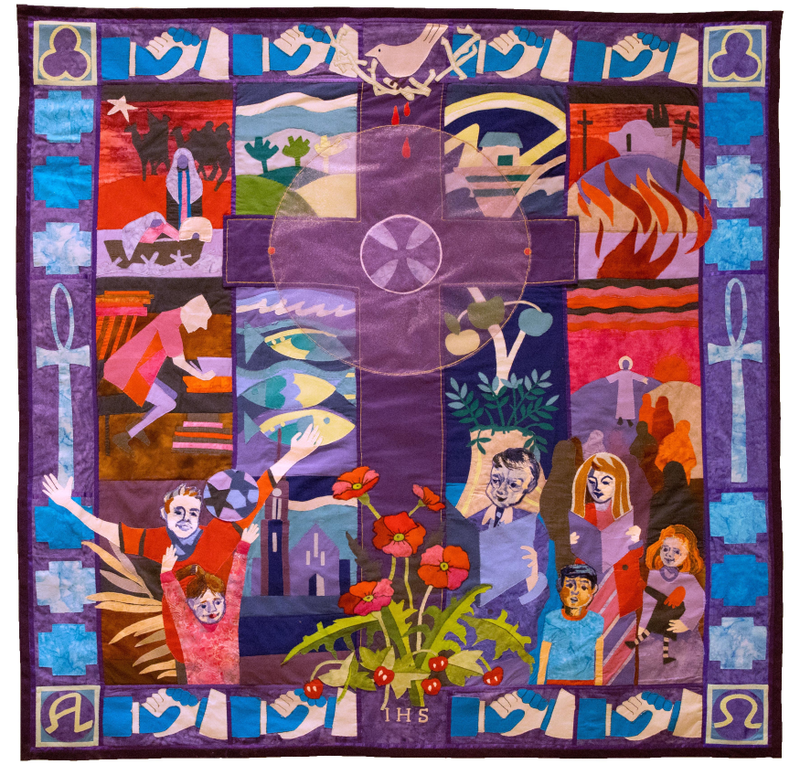 As such, Eco themes of sustainability are embroidered into the general iconography of the design. Strawberry fields, for which Mannofield first became nationally famous, surround the Greek symbols Alpha and Omega, reminding us of the everlasting nature of our faith and the certainty that God is with us till the end of time. 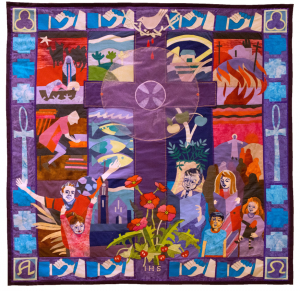 The upper and lower borders incorporate trefoils representing the Trinity, the dove symbolising peace, the crown of thorns symbolising the crucifixion, alpha and omega, the beginning and the end and a shaking of hands symbolising brothers and sisters meeting in friendship and offering help to others. The lower central panel includes the name of Jesus IHS (shortened form of the Greek –ihsous) which, by inference and intent, supports the entire piece. The side borders incorporate simple cross shapes, the symbol of our faith, and the ankh, an ancient Egyptian symbol of life and knowledge adopted by the early Christian church. Jesus made for us that we might live and have eternal life. The four central panels, presented as in stained glass, depict the land and sea, the beauties of our natural world and the resources we harvest from it. They also depict the open fields, the rivers and seas with fish, the bountiful crops of grain and fruit and also our weather cycles. It is intended that these images echo the many references from Biblical text e.g. the great flood including the rainbow, the fishers of men, the feeding of the five thousand, the Garden of Eden and the seed sower. 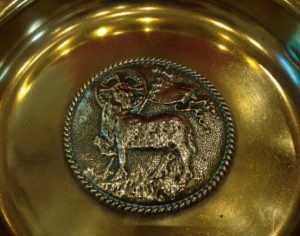 In St John’ Gospel 1:29, John the Baptist on sighting Christ, exclaims “Behold the Lamb of God which taketh away the sins of the world”. The Lamb is Christ and the flag which the lamb is portrayed as carrying is of the patron saint of England, St George. The Main Hall was added in 1910. 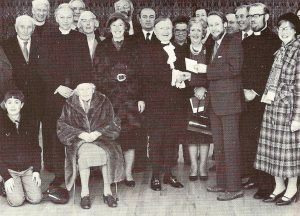 The centenary of our Church was in 1982 and the Rt. Rev. William Johnston conducted the Centenary Hall dedication service on 8th February 1981. Due to the demands on the church accommodation by the many active organisations attached to Mannofield, additional rooms were added in 1994. 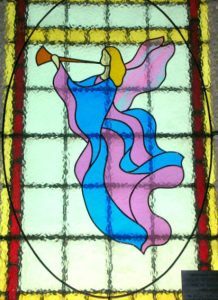 The Angel window was something that former Sunday school teachers Maureen Murray, Diane Bridgeford and Gillian Slessor and their class of girls decided to create as a project in Spring 2005. 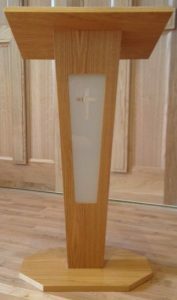 “Kidzone” as it was then called wanted to make something that could be placed in the church for everyone to see. Claire Murray, Catriona MacRae, Ellis Jamieson, Catrin Jones, Kirsten Tait and Olivia Carr were the youngsters involved. Claire found the angel design on clip art and the others approved it. It was then enlarged to the size they required for the window. “First we had the picture of the angel enlarged to the size we required for the window. Then we took our design to the SGO workshop where Mr & Mrs Stone showed us step by step how a stained glass window was formed. The window was installed in June 2005. Sadly, Claire died on 22 December 2005 but the Angel window is a wonderfully fitting memorial to her. Each year the Guild nationally chooses and works on a theme. In 1997 this was “Together for God”. One of the suggestions from the central Guild office in Edinburgh was that each lady (only ladies were Guild members in 1997) should take to a meeting a stone or pebble which in some way represented her. Perhaps this stone came from her garden, from a favourite holiday destination, a picnic spot or a place with memories. Whatever its origins, it would have its own significance to the giver. The idea was to set out night lights in the form of a cross and that in turn each lady placed her stone between the candles. She could then share the story behind the stone or simply put it down. The candles were then lit and by candlelight all thought and reflected on the stories – many sad, some funny, some happy occasions. As you would expect Aberdeen is represented on the Cross by several pieces of granite but so too are many other places throughout Scotland including Iona, the cradle of Christianity in our country. 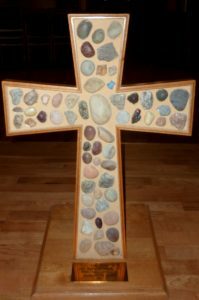 There are stones also from other countries including Cyprus and the Holy Land, with stones from Jerusalem and the Sea of Galilee. M.A.H. 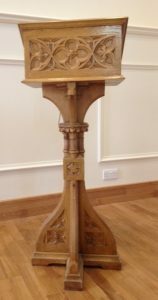 Arthur donated the Lectern in 1936. 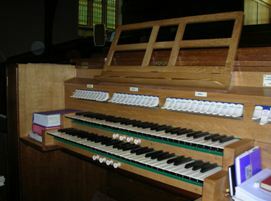 When the chancel area was significantly altered in 1969 by the removal of the organ, choir stalls and central pulpit, a completely new organ was installed in the gallery in September by J W Walker & Sons Ltd at a cost of £7106.